The stage for the Eurovision Song Contest 2017 in Kyiv is taking shape. 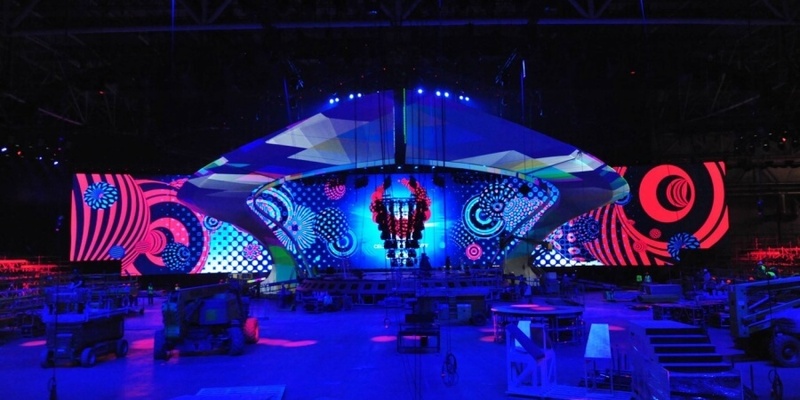 It is a huge stage – Height: 14 meters, width: 70 meters, depth: 28 meters. The stage floor measures 350 square meters and weighs 30 tons. The stage is surrounded by two gigantic arches made for projections. The arches also contains LED strips. There will be 1000 square meters of LED Screens, with a 71 000 002 pixels resolution! In the arena there will be 1816 lamps, consuming 854 000 watts. 61 km of cables are used just for the lighting. Follow the construction inside the Kyiv International Exhibition Center here. Eurovision Stage 2017: Stairway to Greenroom! In the back of the Kyiv International Exhibition Centre the Greenroom will be mounted. The spectator seating area will have around 7000 seats. The Exhibition centre will also host the press centre and delegation area. The expo center is an indoor exhibition center spanning over an area of 58,000 square metres, hosting major exhibitions and trade fairs. The capacity of Kyiv International Exhibition Centre will be up till 8,500 people for each of the three live shows and the six rehearsals, with around 1,500 standing and 7,000 seated spectators.